Get your Wyoming insurance license using an America’s Professor online training course. Our comprehensive video lectures, review questions and study guide will help you learn, and retain, the material needed to pass your Wyoming insurance license exam the first time! Wyoming Bail Bonds students are required to pass the Wyoming Casualty exam. Thanks to the lecture videos and text books I was able to pass on my first try with an 84%! I was worried when I first saw all that was needed to learn, but when it came time to test, I was relaxed and stress free because I was taught everything I needed to know. The practice tests were a huge help and really helped to prepare me. I’ll be moving on to the Life and Health materials through AP very soon, thanks Jack!! Great and informative course!! Highly recommended!!! Excellent course. Very straightforward instruction. The Property and Casualty exams took me about 30 minutes each. I have no insurance background and was given an opportunity to be a Commercial Lines Account Manager. Come to find out most company won’t pay for classes anymore and required you to get licensed in 90 days. Which I disagree, I am a firm believer in having a class prior to any exam. I did my best to learn Property & Casualty on my own within 90 days but, I FAILED the first time , 65 was my score due to the WY laws. I wanted to learn and make sure I pass and not waste anymore time. So, I decided to register through America's Professor. I am busy and was able to complete the course on my pace in 2 wks and rescheduled my retake exam a month from when I took it the first time. The course was easy to follow and Professor Morton really goes beyond what’s in the book to explain the concepts in a simple way to comprehend and help you retain the information. He is also funny, so it keeps the class interesting. Through each chapter he connects all important contents how each insurance lines connects and different. I completed the course and did all of the practice test. Did my final prior to my retake exam. I didn’t even read the book I just did his classes and practice tests. I reviewed and rewatched chapters that I needed to revisit. I did courses anywhere any time and even used my phone too. Each test version is different, if I didn't take this course I would have failed again. Even the hardest question I got through it because I knew my stuff by taking this course. My point don’t waste your time like I did learning it on your own. Some are able to pass without a class, but I am old fashion I need a class. Invest in a class, and you will be less stress and learn a lot. Importantly, you will PASS as long as you focus and listen to the courses. Thank you Professor Morton I PASSED, went from 65 to 85%!!! Which proves when you invest in a class and having a dedicated teacher like Professor Morton, it makes a difference. If your company is not willing pay for your class and it’s required to get licensed. Don’t waste your time just register to a class for your own sanity. In return, you will PASS and retain the information which will make you a confident Producer. THANK YOU!!! I really appreciate this course. I took my exam after I did 10 Days on the course material and I passed with an 87%. The minimum was a 70%. I learned everything with confidence! I am truly grateful for the help. The cost was well worth it. follow the course, do what it says, you will be fine. Thank you for everything! I was feeling very stressed about taking the WY Property and Casualty test, and then I was recommended to take this class. I felt a lot more confident about taking the test, and I passed the test on my first try this morning! Thank you America's Professor!! I graduated from college 23 years ago and haven't taken an exam since then, so needless to say I was a little nervous preparing for my property & casualty. This course is amazing. Very well taught. I followed along and marked my book as I watched the lecture videos, and then took all of the chapter tests several times. I felt well prepared and passed the first time around with a 91%. This course prepared me well for Wyoming's Accident, Life & Health exam. The video instruction was very well done and explained concepts well. The staff was very efficient in responding to my emails in a timely manner. Detailed, thorough course. Passed WY P&C on 1st attempt. Instructor used examples to explain concepts. I would recommend this course. I had no experience in Property and Casualty Insurance but was looking to re-invent myself. America's Professor was referred to me by a local Producer. After watching the videos as directed, I took the Wyoming P & C test and passed with an 88%. I am on my way to a new career thanks to America's Professor! Thank you America's Professor, I passed my test with a 91%. Thank you for offering such a helpful course. My job requires a WY license so failure on the test was not an option. America’s Professor’s course was easy to follow and the each unit reinforced the information previously reviewed. Professor Morton was engaging and gave good examples and made a dry topic palatable. I completed the course and took the exam without any other preparation. I learn best with a lecture and taking notes or highlighting the text as re-enforcement. Without this course, I doubt I would have studied effectively enough to pass the WY adjuster’s examination on the first try. Please also check our frequently asked questions about the Wyoming Insurance Licensing Exam. Whether you’re a seasoned insurance agent who wants to get licensed to sell an additional line of insurance, or you’re brand new to the insurance world, America’s Professor (AP) provides you with everything you need to prepare for your insurance licensing exam. Our comprehensive courses have been carefully developed by our founder, Jack Morton, who has decades of experience teaching students like you. Insurance concepts can be tough to grasp, and insurance terminology can be hard to remember. Jack helps explain these concepts with entertaining stories and straightforward examples to help you remember the information. There is no getting around learning the material—there are simply no shortcuts when it comes to the insurance licensing exam. AP’s courses provide you with everything you need to pass on the first try. Prepare: We can’t emphasize it enough—people who attempt to take their licensing exam without any preparation have little to no chance of passing. The exam is not based on logic—you need to know the material. AP’s comprehensive courses provide you with all the info you need, and the vast majority of our students pass on the first try. When you enroll in one of our exam prep courses you’ll get instant access to our streaming videos, so you can start learning right away. Your hard copy textbook will follow by mail, and you can call our helpful customer service reps any time with questions. Apply: Once you’ve passed your exam, you can formally apply for your insurance license and begin working once you receive it! 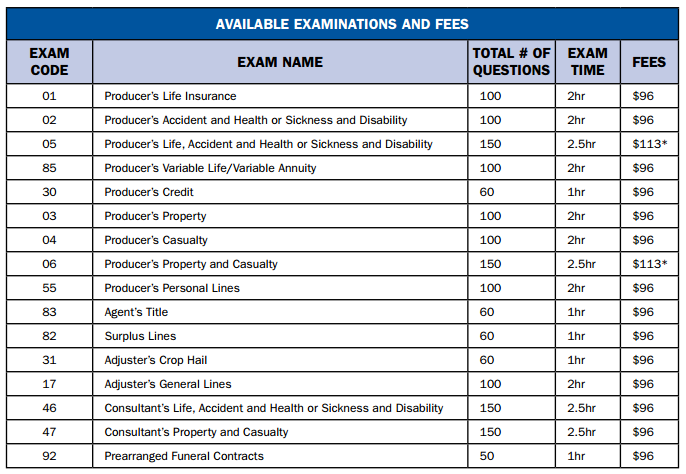 Wyoming offers several different exams (see chart below), including property and casualty separately or together in one exam. Each exam has two sections: a national section and a state-specific section. You need a score of 70 on both parts—the two scores are not averaged together. Click here for helpful information on which tests are toughest in Wyoming, where to take the exam, and more. Test Registration: Pearson VUE is the company that administers the insurance exams in Wyoming. We recommend calling them at least three days in advance to secure the test date of your choice. The number is: 1-866-936-7786. Testing Centers: There are testing centers throughout Wyoming, including centers in Evanston, Casper, and across the border in Idaho and Montana, for those who live near a state border. See the “Where can I take the Wyoming insurance exam?” section on this page to view all testing center locations. Licensing Application Fees: Once you’ve passed your exam you can apply for your license online at nipr.com. The license application fee is $100. Fingerprinting: once you have submitted your application to the Wyoming licensing department, they will send you a fingerprint packet for the background check. Check out the reviews section on this page and hear what our Wyoming students have to say about AP!